Moo Crew, The Primary Dairy Moovement, will be available to primary schools again after Easter 2016 with a programme which expands into the Junior and Senior Infant classes for the first time, all the way up to 6th class; and with extended resources for teachers and pupils. 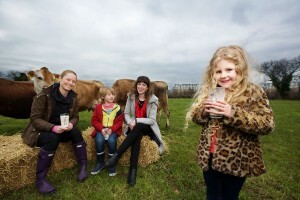 Derval O’Rourke is pictured with Oilibhear Woodward age 7 (Terenure), Caroline O’Donovan, Nutritionist, NDC and Sorcha Woodward age 4 (Terenure) in Dublin at Airfield Farm for the launch of Moo Crew 2016. Picture by Patrick Bolger. Moo Crew was developed by the National Dairy Council in consultation with teachers in light of research that demonstrated the prevalence of a nutrition gap amongst Irish primary schoolchildren, with 37% of girls and 28% of boys aged from 5 – 12 years in Ireland having inadequate calcium intakes in their diet. The popular initiative is a fun and engaging way for children to learn the benefits of a healthy, balanced diet and the importance of exercise – to “get moo-ving”. Now in its 4th year, over 5,000 children from 900 primary schools nationwide took part in the programme in 2015. Moo Crew offers learning supports for teachers which are linked to the curriculum including web-based resources atwww.moocrew.ie such as an interactive food pyramid, video clips and games as well as lesson plans. The lesson plans, available in English and as Gaeilge, help children to learn about dairy and farming and where food comes from. They can explore the journey ‘from farm to fridge,’ while learning about a healthy, balanced diet underpinned by nutritional expertise. 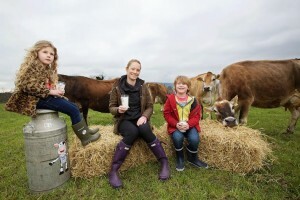 Derval O’Rourke (centre) is pictured with Oilibhear Woodward age 7 and Sorcha Woodward age 4 from Terenure in Dublin at Airfield Farm for the launch of Moo Crew 2016. Picture by Patrick Bolger. This year the lesson plans have been expanded with a new module on the history of making cheese in Ireland, developed in consultation with Regina Sexton, Food & Culinary Historian at University College Cork. The introduction of the additional lesson plan on the history of cheese making was welcomed by three-time Olympian Derval O’Rourke, who is an ambassador for Cheese Up Your Life! and a supporter of Moo Crew. “We know from its success in previous years that children enjoy getting involved with Moo Crew. It helps us to work with children in an interactive way and to get kids thinking about how exercise fits into their daily lives; which interests me as a sprint hurdler and athlete,” says Derval. “But learning about food as a source of nutrition and the ways to consume a healthy, balanced diet to support growth and health – these are really important life skills which help kids to make smart choices,” said Derval. Moo Crew is designed to be linked to the primary curriculum and to be easy to implement in a busy classroom. It also nurtures creativity, team building, literacy and numeracy skills. Milly the cow, the popular Moo Crew mascot, continues to add colour and fun with her exercises, tips and favourite recipes. The top class in the Junior Category (Junior Infants – 2nd class) and top class in the Senior Category (3rd-6th class) will win an amazing VIP farm experience to Airfield Farm, where they will have a day packed with adventure. Each of the two winning schools will also win a training session with Moo Crew ambassador Derval O’Rourke plus a sports equipment pack valued at €1,000. There are also county prizes at senior and junior level. Cheese Up Your Life! is a programme financed with aid from the European Union to showcase the quality and versatility of cheese and how easily it can be incorporated into our lives.